A tenugui sized piece of fabric - UNHEMMED at the edges - measuring approximately 36" x 13" but can be folded to make hachimaki (36" x 3"). Tie with simple knot at back of head for wearing as a Japanese headband. 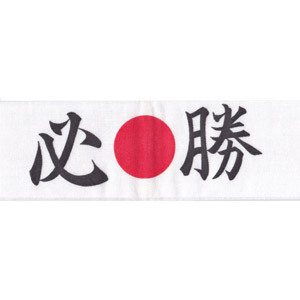 Hissho 必勝 translates as “certain victory” and when worn on a hachimaki means 'determined to succeed or win'. These Hachimaki have been in storage for several years and blemishes/slight discoloration may be present.